Do you know that feeling when you don’t think you got a photograph and you actually did? No matter how long its been since you took the photo, you’re always proud that you got it. Most of the time the photos that were hard to get was because I’m in a moving vehicle – and couldn’t stop. But my latest pride is because this photo was taken late at night, without any flash, and relying on the red lamps of researchers to highlight the area. I was lucky enough to go to Levera Beach on Grenada, and experience the arrival of a leatherback turtle, seeking the sand to lay her eggs. But in order to witness this, I had to follow the rules. My tour group was kept on one side of the beach, waiting in the moonlight. 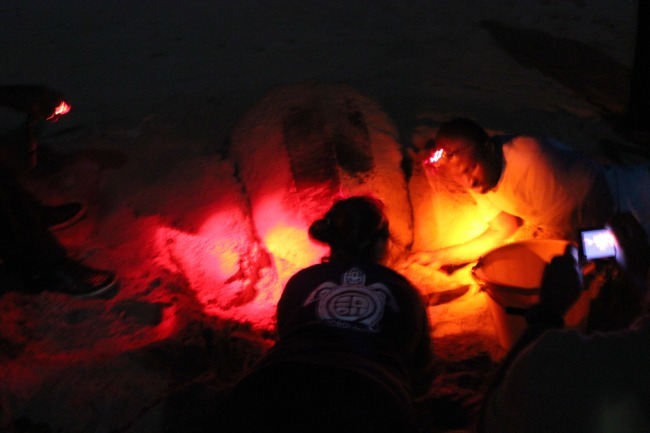 When we were led to the opposite end of the beach, two researchers were in position with their red lights behind a turtle, who had dug her hole and started to lay eggs. The light distracts the turtle, so we were cautioned to not use a flash at any time. As we crowded around to witness the turtle’s laborious efforts to lay eggs, I took many photos, unsure if any of them would work out. After a time, I just watched the turtle’s efforts and forgot about the photos, assuming my skills would not create anything but blurry images of black and red. After witnessing this amazing sight for almost two hours, my group headed back to the bus, and the two hours back to the other side of the island. I went to sleep happy that I had gotten to witness such an intimate act by one of Mother Nature’s creatures. Days later, when I had returned from Grenada and downloaded my images, I saw rows of black and red indecipherable blobs. But there was one that seemed ok – and although the memory is much stronger, I’m glad for this one image from that night.